It goes without saying that today’s busy lifestyles don’t make it easy to stay in shape or get enough high-quality exercise. That’s why finding the right gym and the right set of personal trainers is so important. Our professional-level gym gives fitness enthusiasts a high-calibre environment to work out in, as well as full access to experienced trainers, comprehensive workout options and a wide variety of difficulty levels to ensure there’s always something for everyone. Our Boxing & Fitness Gyms Offer Unique & Comprehensive group training and boxing classes in Brisbane. To find out more, get in touch or drop into our West End or Yeronga locations today. Start your boxing journey by learning the correct technique for throwing powerful punches and giving all of your major muscle groups a terrific workout. Then work your way up to delivering some killer combos. No previous boxing or fitness experience is required. Beginners receive full support and proper training as far as technique and method. Advanced boxers and fitness enthusiasts are met with stimulating challenges. Learn from and grow with some of the most inspiring, encouraging professional trainers to be found anywhere in the Brisbane area. No matter what your boxing and fitness goals may be, we can match you with the best and most beneficial possible solution for you. 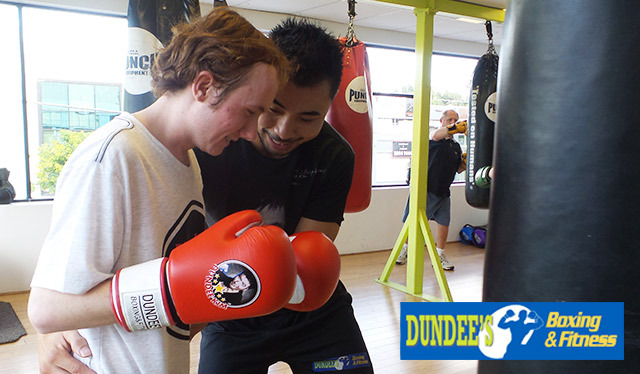 Looking to make friends, get fit and learn boxing through group personal training? Enquire now – first session is free!